This is a wonderful cookbook by a very talented chef and entrepreneurial Lao/American woman, Penn Hongthong. There's 172 recipes ranging from appetizers, soups, salads and sauces, rice and noodles, entrees, a section on lap, sautes, eggs, vegetarian or side dishes, seafood, desserts. There's a glossary section that explains the more exotic ingredients to those who may not be quite in the know about that. There's also an introduction section about Penn and her background and upbringing. It's interesting how early she began cooking with her large family and her sisters. The author hails from Sayabouri (alt. Xaignabouli) in northwestern Laos and currently resides in America (since the age of 18). 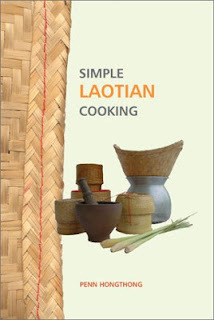 In 2009 she published a subsequent Lao cookbook called Healthy Lao Cuisine. The publisher, Hippocrene, is really good for ethnic food and gastronomy books. My only criticsms of this book are minor: (1) I wish it had more pictures to augment the wonderful recipes and (2) that the English spelling on the Lao words could use a bit of improvement (but I'm always picky on Lao-English writing :-). But otherwise, the recipes are plentiful and easy to follow. I love exploring food and cooking. I do tend to adjust recipes to my own liking and taste. Her recipes provide for me a wonderful base to follow.